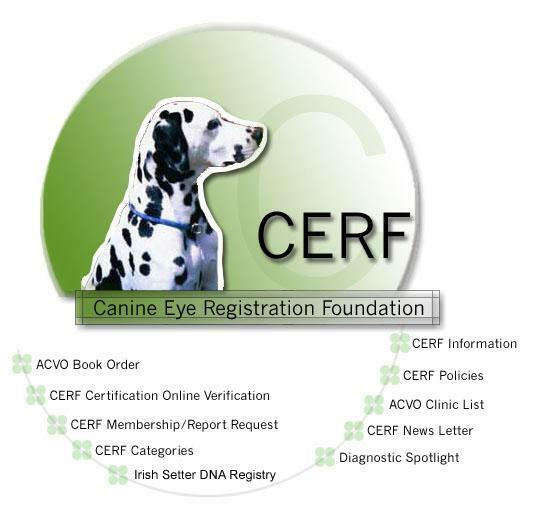 If the dog is certified to be free of heritable eye disease, you can then send in the completed owner's copy of the CERF form with the appropriate fee ($12.00 for the original CERF Registration, or $8.00 if it is a re-certification or kennel rate). Hybrid Registration is $15.00 per dog. Re-CERF or kennel rate (10 or more new) is $12.00 per dog. CERF has adopted a policy effective Jan. 1st, 2001 (by post mark) that a permanent identification in the form of microchip, tattoo or DNA profile will be needed for any dog to be registered with CERF. The certification is good for 12 months from the date of the exam and afterwards the dog must be reexamined and recertified to maintain its' registration with CERF. - Provide various memberships which include the CERF Newsletter, and various registration and research reports to keep you up-to-date on various topics in canine ophthalmology. - Provide various reports on the prevalence of eye diseases in certain breeds, including reports generated by the Veterinary Medical Data Base (V.M.D.B.) which compiles data from 24 participating veterinary colleges in the U.S. and Canada. - Provide a centralized source to answer questions like: - "Is there an A.C.V.O. Diplomate located near me?" -"Are there any published materials on eye disease in dogs that can help me to better understand my dog's condition?" If you are interested in learning more about the CERF organization, the CERF process, or would like to inquire about the CERF status of a prospective mate for your dog, please don't hesitate to call or write. We'd love to assist you! Note: This information was copied from the website with permission from Arthur M Siegel, DVM, PhD Program Manager.